Taro (Botanical name - Colocasia esculenta) is native to India and Southeast Asia. Its roots and leaves are both edible. Taro can be grown in water under flooded conditions like rice and lotus, and also in soil in ground or large containers. Follow the step-by-step guide on how to grow taro at home and how to care for taro plant including its roots and leaves with information on its propagation, pests, diseases, harvesting and fertilization. Taro is known by different names in different countries. Some of its names in India are taro, arbi, eddoe, kasu, pan, bal, ghandyali, sivapan-kizhangu (seppankilangu or cheppankilangu), chamagadda, chaama dumpa, etc. Taro is also known as chamadumpa, bun long, dasheen, elephant ear plant, kalo, kochu, mukhi arrow root, ggobe, nduma, kolkas, gabi, toran, aroei, sato-imo, kimo, cocoyam, edo, yu, yu tou, woo, wu choi,etc. outside India. The most common name is Elephant Ear. Both the leaves and tubers (roots) of taro plant are edible. The taro leaves are eaten by making many dishes such as Pataud or Patra or Patrode or Aluchi Vadi, Hawaiian laulau, Palusami, etc. 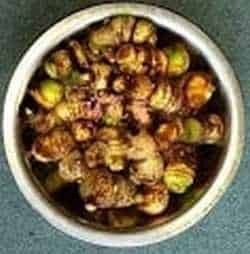 The taro roots can be used in dishes like pancakes, cheese cake, Cake (Woo Tul Gow), pie, fries, taro ki sabji, Savoury taro, satoimo taro chips, etc. Taro is nutrition rich containing iron, fiber, magnesium, potassium, zinc, manganese, copper and phosphorus. It is also high in antioxidants, vitamins A, B6, C and E. No wonder, taro, both roots and leaves offer many health benefits. But weight watchers should not overdo it, iIt has more carbohydrates by volume than potatoes. 100 grams of taro contains 112 calories. So eating too much taro is not good for fat loss. Taro is a perennial herbaceous plant, means it has no woody stem above ground at the end of the growing season and its leaves and stems die down to the soil level. The taro plant grows from 3 to 6 feet tall. 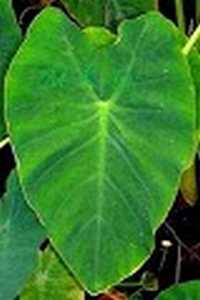 The leaves of taro are large heart-shaped, similar to an elephant’s ear with light green purple colour. Tubers are elongated round, about the size of a tennis ball which are covered with brownish skin and hairs. Its stems are thick fleshy and juicy and grows up to 1.5 m in height. Flooded or wetland taro production in water, you can use buckets or big jars or nay pot. The taro corm yields grown in water are much higher than grown in soil and the weed infestation is minimized by flooding. In Asia it is often planted in wet fields. Following is the detailed information for growing taro from tubers in ground in garden beds or pots. Taro is propagated by tubers or suckers. There are various cultivars and forms of Colocasia esculenta for growing in wet conditions (in water) and in dry conditions (in soil). The taro varieties are often grouped by the color of the flesh of their tubers which range from pink to yellow to white. The cultivar Bun-long grows well in tropical zones. Its roots are white, dense and starchy flesh which are excellent for eating. The Chinese variety grows well from northern NSW to south-east Qld. li>In the USA, Trinidad dasheen grows well. Taro can be planted any time of year in frost-free areas and in spring in cold areas. It requires at least 200 frost-free days to reach maturity. In Australia, it can be planted almost the whole year. However taro roots grow well when the temperature is 25-35°C. Taro grown for its leaves can be grown in temperatures as low as 10°C, outdoors or indoors (in a greenhouse). Taro grows well in a soil pH above 5.5 - 7. Dig the ground to a depth of 12 inch and break big chunks of soil. If the soil is clay mix some river sand to make it free draining. The question is should elephant ears be planted in sun or shade, how much sun? Taro grows well in partial shade. Choose a bright area in your garden which receives maximum rain water, even where water is clogged. The elephant ear plants thrives in a large amount of filtered sunlight, both indoors and outdoor. Make sure that you plant edible taro and not ornamental type which is not edible. Buy taro corms from a garden shop. Planting taro bought from a grocery store also grow well. I plant the taro tubers bought from a vegetable shop. Plant taro when the soil has warmed in spring. Separate an offshoot from a plant when it is about 15 cm tall and put in soil. Plant taro corms in ground in furrows or trenches about 15 cm (about 3 times the size of tuber) below the soil surface, at least 30 cm apart with 1 m between rows. Cover corms with 8-10 cm of soil. The tubers will germinate within a few days and a small leaf will emerge from the ground. Tubers can be forced to produce shoots in a warm bed of sand. I did't have a large garden bed, so I grew taro in a large rectangular container with only 3 taro tubers and it produced reasonably good crop. Year-after-year, I am growing taro in the same container and regrow them. In very cold areas, it can be grown in a container in a greenhouse. Plants grown in a greenhouse should be misted timely. Taro needs plenty of water, so keep the plants well watered. It is important to keep the soil moist at all the times. Fertilise two or three times during the growing season with potassium rich fertilizer. Potassium deficiency can cause chlorosis of leaf margins and death of the roots. Zinc deficiency results in inter-veinal chlorosis. Phosphorus deficiency causes leaf petiole. I feed with high-potassium liquid fertilizer like comfrey tea, compost tea or seaweed solution every third week. Aphids, red spider mites, taro beetle, taro leaf blight and downy mildew may attack taro. Mulching with polythene, coconut husk or grass has only been partially effective in the control of the taro beetle and the taro leaf blight. Planting at high density, intercropping taro with other crops and crop rotation can control taro leaf blight. The crop matures in 7-12 months depending on the weather. Pull out the tubers from the soil when the leaves begin to die down. If you want to eat taro leaves, cut them as and when you need them. New leaves will emerge again. I harvest leaves many times during the whole growing cycle to make "Patra" or "Pitod". Clean the taro corms and store in a cool, dry place. Consume the largest tubers first as they do not keep as well as smaller tubers. It is better to leave the tubers in the soil until needed, as they do not store for longer than a month if taken out. Flowers are infrequent and it rarely sets seed. Is taro root toxic? Are taro leaves harmful? Taro contains soluble and insoluble oxalates. Sobule oxalates are more harmful as these are more readily absorbed in the gastrointestinal tract. Thoroughly cooking the roots and the leaves destroys most of the calcium oxalate to make them edible. Eating this toxin contributes to gout and formation of kidney stones.